Breyer makes some good tack and accessories, and this picture can show in harness classes. Copyright 2011 by Diane Teachworth. Used with permission. What makes a prize-winning performance setup at a live or photo show for model horses? Is it the stunning Breyer horse, the realistic tack, the doll poses perfectly, or in photo shows, the scenery? From the very simple to the complex, the following model horse performance setups may inspire you to create your own. Always choose your best models - the ones in the best condition, not necessarily the rarest! Choose models suited to the performance class and task at hand. Make sure the tack is appropriate for the class you plan to enter. Use sticky wax / museum wax to hold wiggly bits and bit rings in place. Watch the accessories such as boots and martingales in English performance classes. Check the show rules or the rules for real horse shows to make sure the accessories are acceptable. If using a rider doll, make sure he or she is dressed appropriately. It's better to leave the doll out of the scene than to have one that is out of proportion to the scene, positioned poorly, or dressed incorrectly. Don't use too many background accessories such as trees, rocks and plants. Keep photos and setups simple so that the judge can see the horse model. Are you ready to create your prize-winning performance scene? Let's look at some terrific performance pictures taken by collectors from around the world! A Breyer horse shown in halter showmanship with doll handler. Copyright 2011 by Kollean Gouyton. Used with permission. Here's a great example of a halter showmanship photo. The Breyer horse is presented well in an arena setting. The tack fits well, and the rider doll is outfitted appropriately. The image is clear and taken with good lighting. There are no harsh shadows and no extra accessories to take your eyes away from the nice horse model. This picture was taken by Kollean Gouyton of Stone Wolf Creations, Alaska. Copyright 2011 by Andrea Robbins. Used with permission. Copyright 2011 by Andrea Robbins. Used with permission. Dressage offers model horse collectors the chance to show their favorite Breyers in an English riding discipline emphasizing the horse's athelticism, willingness and responsiveness. Collector Andrea Robbins takes home the blue ribbons with this photo show picture showing a dressage performance class. The picture shows the model at an angle, but the angle enhances the setting and gives the picture a feeling of motion. The tack, horse model, and rider doll are perfect in the scene. Note the low fence around the dressage arena and the arena markers. Kevin McFarland makes very realitic model horse dioramas, scenes and props, and they are used in live and photo shows worldwide. Kevin's creation was photographed at a live model horse show but could also be used in a photo show setting. Note the fence made from rocks he glued together, the hunting dog, the rider doll and the tack all appropriate for an outdoor hunt scene and a hunter over fences or fox hunting scene. A true show ring hunter wouldn't have a dog in the scene, but it is a fun accessories for fox hunting dioramas! The saddle and rider could be positioned a little differently, but it is indeed a blue- ribbon winning hunter entry. Jumping class setup for model horses. Copyright 2011 by Jane Cadwalader Schneider. Used with permission. Jumpers and jumping classes for model horses typically involve an elaborate and high fence. Horse models in jumper classes must look athletic and willing. The fences can be very elaborate and include water obstacles and fancy standards. Rider dolls may wear typical English style riding attire or the more relaxed jumping style. Jane Cadwaldader Schneider contributed this picture showing an Artist Resin model horse soaring over a high fence. The rider doll, tack and entire scene exemplifies the world of real horse-show jumping. An English trail class is a great class for beginning model horse hobbyists to enter. Copyright 2011 by Kollean Gouyton. Used with permission. English trail is a great class for beginners because many model horse props, including Breyer tack and accessories, can be used in your show ring setting. All you need is a horse model, an English huntseat saddle and bridle, and ground poles or another obtacle. Trail includes many obstacles including gates, water obstacles, bridges and ground poles. Whether you're new to showing model horses or an old hand at it, English trail offers a great performance class to try. This performance photo of an English trail scene includes a model horses, casual English tack, and Breyer ground poles. It shows you what you can put together to create a photo show scene with out of the box Breyer components. Showing model horses in harness classes requires a model horse, the appropriate harness, and if included, a great vehicle. Copyright 2011 by Randa Garrett. Used with permission. A great harness class entry may include a vehicle or not, but it always includes a horse and harness! Harness class entires must be researched thoroughly, and this lightweight fine show harness, light breed horse and show vehicle are perfect for a horse in harness class entry. 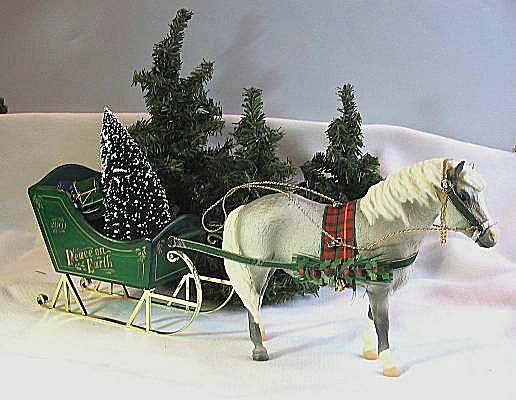 You can show your model horses with any type of vehicle, including winter scenes with sleighs instead of carts or carriages. Research the various types of horse drawn vehicles and be sure to choose an accurate, historical match of horse breed, harness type, vehcile and if you include a doll, accurate costume or clothing. Saddleseat model horse with rider, ready for a performance class. Copyright 2011 by Joyce Savage. Used with permission. Are you ready to enter your Breyers and model horses in performance classes? You can purchase Breyer ready-made accessories from your local Breyer dealer. Schleich also makes fencing, riders, carts and other vehicles that fit their line of horse models. Many Breyer accessories fit Peter Stone model horses, too, so they can be adapted to showing your Stone models in live or photo shows. There's a great difference among individual resin artists as to the scale of their Artist Resin model horses, so some Breyer tack and accessories may fit a resin, but some might not.